I'm keeping my first batch of Oktoberfest grub simple. 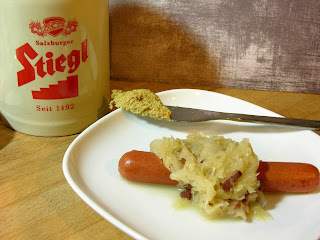 Sauerkraut and bratwursts, or wurstels, depending on your mood, with some homemade beer-based mustard. You'll have a decent batch of kraut leftover that will be great for hot dogs or potato pancakes. The mustard is made with a Belgian beer and just a hint of caraway--the idea was to try to create some competition for one of my favorite wurst condiments, Senf (mustard, but with more awesome). 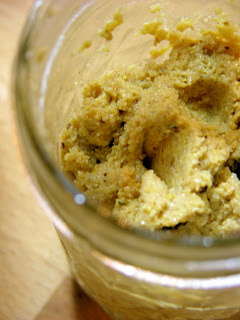 My favorite in particular is the Austrian Mautner Markhof Senf (mild or spicy)--hands down it's still my favorite, but the Oktoberfest mustard I made is also pretty darn good, and it's a little more accessible. 1. Rinse the sauerkraut in a colander, let drain. 2. Cut the bacon strips into small pieces and cook until they become crispy bits. Set aside and reserve bacon grease. 3. Meanwhile, saute onion in a little olive oil and cook about 5 minutes, or until onion is soft. Add a tsp or two of the bacon grease and stir in the bacon bits. 4. Add ingredients shredded potato through water, let simmer with the lid on for about 25 minutes. 5. Add vinegar to taste, simmer half covered for about 40 minutes. Serve with sausages and mustard, and maybe a soft pretzel if you happen to have one around. As with most things, it tastes even better the next day. *I like to add beer vinegar to my sauerkraut, homemade mustard, and potato salad, but you can always sub in white wine vinegar if necessary. I think the beer vinegar gives it a better flavor and adds more depth. Combine all ingredients in a bowl and let stand overnight or about 24 hours. In a food processor, blend until the desired consistency is reached. If you're blending until smooth, you may want an ounce or two more liquid, as the mustard tends to get a little drier the longer you blend. A little extra beer never hurt anything.